Home » Blog » Digi always the smarter choice? Digi always the smarter choice? Recently they have just launched a new service called “e-billing”. It’s a full and complete billing system online whereby Digi customers are able to check their bill for 6months and they can even download it as PDF file or EXCEL file and do some comparison or some kind of report so that you know how much u spend. Personally I think it’s a very good and it could benefit all the Digi customers. So for this, yes, it’s always the smarter choice. So I have called to cancel my previously subscribe itemize billing but it called and requested to cancel twice and it’s still showing in my Online customer Service “http://www.digi.com.my” as I still subscribe to the itemize billing. So do you think DIGI is smart enough? I have called Digi Customer Care all these while and it seems to be the better Customer Care compare to other Customer Care which I have a lot of bad experience but then recently I was pissed with Digi Customer Care. Every question I asked on the phone, he will ask me to wait and the he will go around asking either his senior or supervisor and keep me holding the phone for more than 30 mins… Aren’t they supposed to be well trained and well informed about all the DIGI latest news, promotions, products and services??? 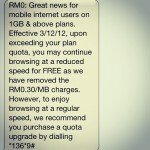 Finally Maxis Listen To The Users, Offering Unlimited Mobile Internet Usage Without Over Charge! i like yr idea.. done a good job.